A geothermal heat pump system is a central heating and/or air conditioning system that actively pumps passive energy to or from the shallow ground. It uses the earth as either a source of heat in the winter, or for cooling in the summer. This design takes advantage of moderate temperatures in the shallow ground to boost efficiency and reduce operational costs. In South Africa, due to the usually warm climate, the majority of systems will only be used for cooling and providing hot water rather than heating. Since we are only moving energy and not generating energy such as heat, high COP values can be achieved. For example, 1 unit of electrical energy can be sufficient to move 3 units of earth energy to deliver 4 units of space heating which results in a COP = 4. When the flow is reversed to provide cooling, a similar high level of efficiency can be realised with EER's from 12 to 26. Geothermal heat pumps are also known by a variety of other names, including geoexchange, earth-coupled, earth energy, ground-source or water-source heat pumps. The engineering and scientific community tend to prefer the terms "geoexchange" or "ground-source heat pumps" because very little of the heat originates from true geological sources. Instead, these pumps draw energy from shallow ground heated by the sun in the summer. Genuine geothermal energy from the core of Earth is available only in places where volcanic activity comes close to the surface, and can usually be extracted without the help of a heat pump. Like a refrigerator or air conditioner, these systems use a heat pump to force the transfer of heat. Heat pumps can capture heat from a cool area and transfer it to a warm area, against the natural direction of flow, or they can enhance the natural flow of heat from a warm area to a cool one. The core of the heat pump is a loop of refrigerant pumped through a vapor-compression refrigeration cycle that moves heat. Heat pumps are always more efficient than pure electric heating, even when extracting heat from air because most of the time the ground-source heat pumps run in cooling mode. But unlike an air-source heat pump, which extracts or exhausts heat to or from the outside air, a ground-source heat pump exchanges heat with the ground. This is much more efficient because underground temperatures are relatively stable throughout the year. Seasonal variations drop off with depth and generally disappear below 10 m. Like a cave, the shallow ground temperature is warmer than the air above during the winter and cooler than the air in the summer. A ground-source heat pump extracts that ground heat in the winter (heating) and exhausts heat back into the ground in the summer (cooling). The system cost is higher than conventional systems, but the difference is usually returned in energy savings in 3–10 years. System life is estimated at 25 years for the inside components and 50+ years for the ground loop. As of 2004, there were over a million units installed worldwide providing 12 GW of thermal capacity, with an annual growth rate of 10%. If deployed on a large scale, this technology will help alleviate energy costs and global warming. 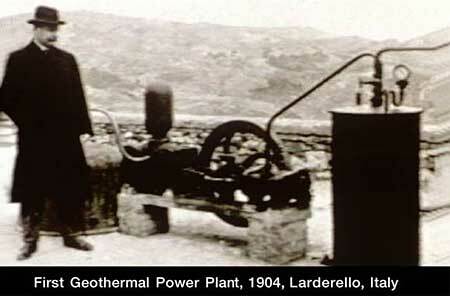 The heat pump was imagined by Lord Kelvin in 1852 and developed by Peter Ritter von Rittinger in 1855. After experimenting with a freezer, Robert C. Webber built the first direct exchange ground-source heat pump in the late 1940s. The first successful commercial project was installed in the Commonwealth Building (Portland, Oregon) in 1946, and has been designated a National Historic Mechanical Engineering Landmark. The technology became popular in Sweden in the 1970's, and has been growing slowly in worldwide acceptance since then. Open loop systems dominated the market until the development of polybutylene pipe in 1979 made closed loop systems economically viable. As of 2004, there were over a million units installed worldwide providing 12 GW of thermal capacity. Each year, about 80,000 units are installed in the USA and 27,000 in Sweden. Heat pumps provide wintertime heating by extracting heat from a source and exhausting it to the building. 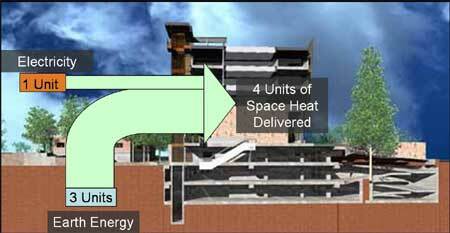 In theory, heat can be extracted from any source, no matter how cold, but a warmer source allows higher efficiency. A ground-source heat pump uses the shallow ground as a source of heat, thus taking advantage of its seasonally moderate temperatures. In the summer, the process can be reversed so the heat pump extracts heat from the building and exhausts it to the ground. Exhausting heat to a cooler sink is more efficient, so the air-conditioning efficiency of the heat pump again benefits from the moderate ground temperatures. Ground-source heat pumps must have a heat exchanger or a geothermal loop in contact with the ground or groundwater to extract or exhaust heat. Several major design options are available for these.